But first, a little research. How exactly were we going to pull this off? We both had a vague idea that it had been done before so it was a matter of doing a little poking around online to see what we could find. I asked around on the Final Cut Pro X Editors Facebook Group (a must join group, and invaluable resource if you ask me) about solutions and many people recommended the Lumberjack System. After some reading, and poking around (thanks to a free trial from Philip Hodgetts, thanks Philip!) I determined that as cool as the system was, it wasn’t really designed for our purposes this time (though I could think of plenty of other shoots where it would be indispensable). We weren’t shooting a doc, or an event, but rather a scripted commercial with shot break-downs and storyboards. And that’s when I remembered something mentioned in Mike Mazdorff’s fantastic “Final Cut Pro X Workflow” book, Shot Notes X. Shot Notes X allows you to take notes provided by an on set script supervisor and then quickly and easily marry it to your Final Cut Pro X library. The only problem was we didn’t have a script supervisor. But since I was going to be on set the whole day anyways and wouldn’t be doing much until footage was in my hands I figured I could take the task on myself. Sounds perfect. At first I planned on just exporting the Shot Log Template from the App and filling it in as I went but I soon realized that would require me to have my laptop with me on set the whole time, which could be difficult since it was mostly standing room only. I could take notes on a notepad and transfer them in later, but that felt like it was more work than was worthwhile. So I started trying to find one of those script supervision apps they mentioned. It would have been nice if the Shot Notes X name dropped a few apps for those of us who aren’t actual script supervisors and are hunting for the right companion tool, but thankfully a quick search in The App Store yielded some results. While this shoot was technically “scripted”, there was no dialogue and as a result no real script to speak of, so some of the more powerful tools were definitely going to be overkill. I downloaded a few of the apps and eventually came across Set Report by Drylab R&D. SetReport for iPhone made logging a breeze. For only ten bucks it seemed to be exactly what I needed: I could log each individual shot, take notes about each take of that shot, and in the end export all the info and email it to myself at the end of the day. Since I was learning the app on the fly on set it took a little while to get used to it and figure out the best workflow, but thankfully the app wasn’t so complicated that it couldn’t be figured out in the downtime between setups. By lunch I had settled into a nice groove. The app was great because it automates a lot of things for you, and allows for you to enter in a ton of data. Because I was still figuring things out as I went I kept it to the bare minimum for what I knew the director needed: shot number, take, scene, quick keywords recorded as tags, comments, and roll. That said, you could add in lots of additional material like scene descriptions, and all sorts of metadata for each shot (such as lens, colour temperature, ISO, etc. ), meaning you could have quite the report at the end of the day when you go into the edit. The on set workflow was pretty simple: First I’d create a new shot entry, and a corresponding scene (because we were shooting a short commercial each scene had only one shot so this was pretty painless, but you could easily create multiple shots for multiple scenes). Then I’d create a new take. I’d double check that my roll was set correctly (using the director’s video monitor as a reference) and used the RED preset to ensure the filename was accurate. I’d also set a few quick “tags” depending on the type of shot. Then as the scene would play out I’d make quick notes in the comment field. If the shot was good, and the director/client liked it I made sure to note it in the comments, as well as add the “circled” tag. Then after a cut I’d add another take and repeat the process. Filling in meta-data in real time. One of the great things about “Set Report” is that it has an automatic counter for take and filenames. The way in which this worked did cause some confusion for me at first, and I did run into an issue when we continued to use the same roll into a new scene and the take numbers reset the file counter, meaning I had to set my takes to continue where we left off (so instead of saying take 1 it actually had to say take 13 to ensure the file number was 13). I just made sure to note what take it actually was in the comment field and figured I’d fix it later. This only happened a handful of times and I’d chalk it up to user error on my part, not the app (again, I was figuring this out as we went). At the end of the shoot I brought home a copy of all the media, emailed myself the camera report out of “Set Report” and set to work at matching everything up. 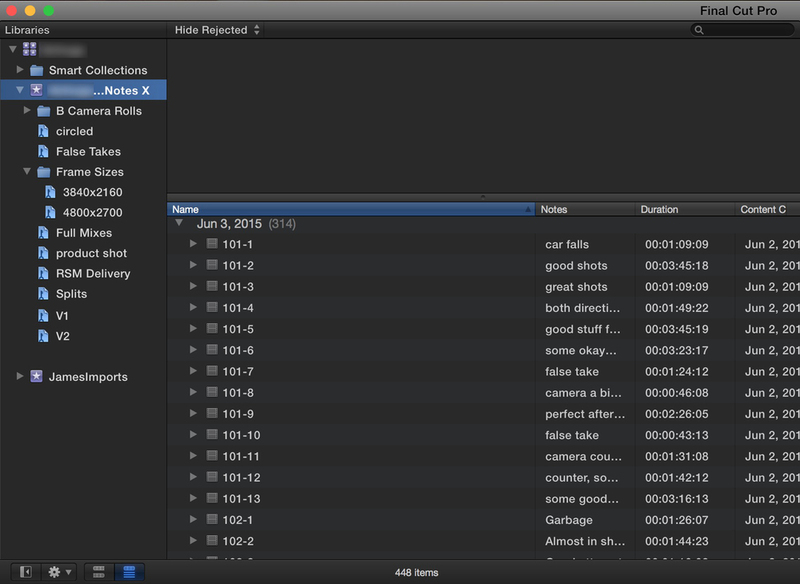 First I exported the XML of all the RED media from Final Cut Pro X and brought it into Shot Notes X. Next I used Shot Notes X to export a shot log; this gave me a properly formatted CSV file with all of the correct filenames straight out of Final Cut Pro X. I then opened that shot log in Apple’s Numbers app, along with the Set Report I had emailed myself earlier. Because the format out of Set Report was slightly different from that of Shot Notes X (for starters, it was an HTML file), and I didn’t want to waste time doing things incorrectly I opted to take the extra 30 minutes or so to migrate the data into the Shot Notes X generated CSV. This may have been unnecessary but I didn’t want to find out the hard way. The biggest issue was with the file names. Although Set Report did a pretty good job of auto-generating them based on the RED conventions, all of the actual files from the RED had 2 letters appended to the end of each filename. These were not present in the Set Report and I was concerned that this could cause issues with Shot Notes X. That said, because the rest of the numbers matched up just fine it was a simple copy and paste task to get things lined up properly. There were a few other changes along the way as well: I had to fill the “Scenes” column in manually since the camera report only listed this once, rather than with each take. But with copy and paste this took mere seconds. “Takes” always came in fine, apart from those few instances where I screwed up on my end and had to have the counter continue to get correct filenames. Again, this was easily fixed manually. I pasted all my “Comments” from the set report into the “Note 1” column, and any time a take was considered a circle take I noted that in the “Note 2”, and I also flagged it as a favourite. Tags were dumped into “Keywords”, and false takes were marked as rejected. Shot Notes X couldn't be easier to use. All in all this process for everything took maybe an hour. With the CSV prepped I popped it into Shot Notes X and let the magic happen. Within seconds it had processed all my clips and built me a brand new event. The end results were like magic! All my metadata came over perfectly, and even clip names were renamed to Scene-Take. I spent a little extra time organizing the library some more, putting keywords into folders and the like, but was surprised at some of the built in keywords Shot Notes X had generated for me (such as Frame Sizes). I was very impressed, and so was the director who remarked at how amazingly clean the project was. It confirmed for us that this was a workflow we would be continuing on further projects. A fully organized event straight out of Shot Notes X.
Needless to say I’ll be using Shot Notes X again. This revolutionizes my workflow and saves me an incredible amount of time. Granted it’s perhaps not a perfect solution; if you don’t have an on set script supervisor it does require you to be present and active during the shoot. But considering in the past my time is spent sitting around waiting for cards to be delivered anyways, it makes the day go by much faster. I’d also perhaps want to investigate some more options for doing the on set reports. While Set Report did the job, and was easy enough to figure out in real time, the reports it spits out aren’t perfect and require a little more time on your end to get into a the proper format (though, again, this may not actually be the case as I didn’t attempt to feed the generated report directly into Shot Notes X). However, the amount of time spent migrating that data is a mere fraction of the amount of time it would take to add all the meta data manually, and is a much preferable experience. In a perfect world it’d be great to see an official Shot Notes X companion app that allowed you to build exactly what you need on set (maybe I should learn Swift and build it myself). Simply put, if you are editing scripted material you’ll want to get Shot Notes X into your workflow. It saves you hours of time logging, and allows you to start cutting almost right away, which is the greatest feeling in the world!